Submitted by witness on Thursday, August 18, 2011. OBSERVED: It was later June when I was going to the camping trailer to go to the bathroom I saw something out of the corner of my eyes as I was opening the door I looked to the left where I saw this creature walking upright and while it was walking it turned at the waist and his head a little to look at me I guess it heard the trailer door but it was maybe 7 or 8 ft tall I have a pic of a foot print from the back of my property on my cell phone with my foot next to it. I couldnt believe my eyes. I didnt tell my husband for two days. we also have something like a bedding area it was staying in I do believe. I dont know anything else that would have done that a tree snapped up high. ALSO NOTICED: We were hunting in our woods and heard a weird noise like a month before the sighing. It didn't sound like any animal that we ever heard. OTHER WITNESSES: Not sighting only me. My husband found print. OTHER STORIES: Only what I have read. TIME AND CONDITIONS: Between 10 or 11 at night. neighbor has a light next door and we have lights outside not in that area but you can see that way from our neighbor's light. ENVIRONMENT: Native hardwoods mixed with some pine, moderate underbrush, gently rolling hills. Multiple water sources in the area. There is an 11,000 acre Wildlife Management Area within a few miles as well. Subject interviewed on property Sept 25, 2011. She reported that she and her husband have heard vocalizations from the wooded portion of their property in the previous months. Additionally, a relative had a visual encounter while hunting the property approximately 10 days prior (to be submitted as another report). She reports seeing a large, upright, bipedal figure moving across her property. The distance was some 40 yards away & was lit only by her neighbor's porch light, some 60-80 yards behind the animal in question. She said she only saw it "for a few seconds", but was sure about it being "upright and bipedal". She states she was sure it was not any other known large animal including a bear, cow, horse, etc. She is not able to give any further description of the animal's features due to the poor lighting. Subject reported measuring a single footprint at 14 inches in length and 7 inches wide. The track was left on a road where a known game trail crosses it. The soil is quite sandy. I was shown the footprint found some days later that was poorly formed when viewed. Considering the length of time passed, it was difficult to accurately assess the print. A possible nesting area was also assessed. It consisted of three small cedars that appear to have been pulled towards each other forming an area of about 6-7 feet across. 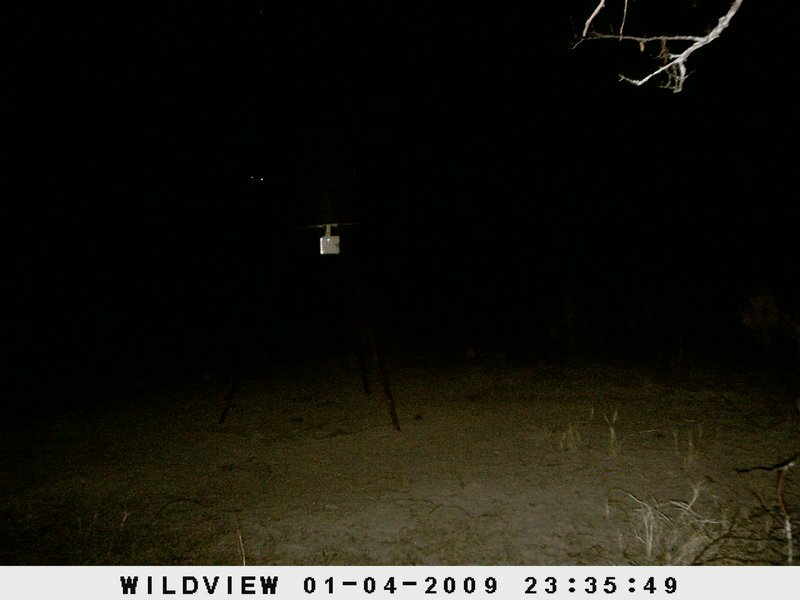 Additionally, a game camera photo showing eyeshine was reviewed. It is interesting to note that the height of the eyeshine is considerably higher and some distance behind the feeder, far enough to be beyond the camera's flash. The distance between the eyes would rule out any of the usual suspects. The area surrounding the feeder is level and I would estimate the height of the eyes above the ground to be about seven feet and possibly six to eight inches between the eyes. Cliff is a native Texan who grew up camping, hunting and fishing throughout the Southwest. He is a veteran of the U.S. Air Force serving more than ten years and has been in healthcare for eighteen years with a strong background in Biology, Anatomy and Physiology. Cliff is currently working in critical care. He has a particular interest in studying the human reaction to encounters and interpretation of sasquatch behavior. He has attended conferences on the subject and has attended BFRO expeditions, both public and "members only" in Oklahoma and Arkansas as well as several private expeditions throughout Texas, Oklahoma, Arkansas and Louisana. For questions or comments, Cliff can be reached directly via e-mail at bfro.texas@yahoo.com.